If you follow my twitter feed, or the feed of the @stemlyns team then you will know that we are advocates of ED RSI. Our patients often present unexpectedly, in extremis and with airway compromise. Resuscitation begins with A for airway so if you envisage yourself as a resuscitationist then many of us believe that you should be able to manage the airway. However, whilst we believe that this is the case in many places around the world, it is not the case across the UK. Previous surveys have demonstrated a patchy and inconsistent approach to airway management in the ED by emergency physicians. Even in Virchester, which is renowned for being EP #RSItastic not all consultants are prepared to perform RSI. Why is this? Our training programs require us to rotate through a 6 month anaesthetic attachment where there is ample opportunity to learn psychomotor skills and to acquire the required knowledge to perform an RSI. There are courses to attend such as the airway course, there are Sim courses in the UK and abroad and I know of no hospital in the country where an EP would be unwelcome in theatre to spend time with the anaesthetic team to maintain and develop their skills (anaesthetists are awesome and are the airway experts after all). I’ve done 12 RSIs in the last 3 months so may be a bit of an outlier, but perhaps not as in Virchester I think we do at least one RSI per day for a whole variety of reasons reflecting our city centre, urban, trauma centre, high volume workload. Are we an outlier? Is Virchester completely different to the rest of the UK or are there departments doing it better? This month we have a great paper to review that may answer some of these questions and one that certainly sheds light on the importance of collecting data on complex events in the ED. As always, the abstract is below but please get on line and if you can read the whole paper as there is some really interesting data here that could really change the way that EPs practice in the UK (to the benefit of patients). This paper is important for UK emergency physicians and for UK training as it demonstrates a mature approach and system to RSI in the ED, but this is journal club, let’s look at the paper in more detail. This is an observational study based on the EDIR (Emergency Department Intubation Registry) which has run in Scotland for many years. The EDIR records all intubations performed in the ED with this paper presenting data from 1999 through to 2013. That’s a very long time and as such that’s a limitation. Clinical practice, technologies and drugs have changed a great deal over that time as has the training and seniority of medical staff in both anaesthetics and emergency medicine. Such long time scales in a study can introduce bias if success rates or other outcomes have changed over time. Ideally the authors could have looked for trends over time to see if this effect may be apparent, but I cannot find such an analysis in the paper. The data has in the most part been collected prospectively and using a standard system that does allow a degree of analysis. It can only tell us what happened though, the why and whether one component of the system was better or worse than another is open to conjecture and we must be mindful of this when interpreting the authors conclusions. The database includes all intubations in the ED and this is important. Whilst many EPs are happy to attempt intubation in the nearly dead and the newly dead it is the introduction of sedation and paralytic agents that seem to be the barrier to widespread adoption of UK EP facilitated RSI. In my mind there is a clear distinction between a planned intubation following drug administration and emergency intubation as part of a cardiac arrest scenario. In the paper the number of patients intubated in the study roughly 3/4 would constitute RSI patients. Others include patients in cardiac arrest and patients receiving just paralytics, a bit of a mixed bag, a proportion perhaps representing the newly dead and the very nearly dead. In summary it is a mixed population (not just RSI) typical of a busy UK ED. Who intubated and did they succeed? Roughly 3/4 of the intubations were done by emergency physicians. This may surprise our international readers, but that’s a high percentage for the UK (Ed – probably close to Virchester, but we are an outlier too). The success rate was over 99%, with a first time pass rate of 85%. Fewer than 0.2% of patients required 3 attempts at intubation. Not bad numbers and success rates in my opinion. Five patients (of the 3738 studied) progressed to cricothyroidotomy representing the very rare nature of this technique in the UK. The process of airway management described is not an us vs. them but rather a collaborative approach where a senior anaesthetist is asked to attend for drug assisted intubations. The anaesthetist generally remains in reserve whilst the EP proceeds with the RSI. It is this interaction and mutual support that assists the maintenance and development of ED RSI skills in a UK department. Our international colleagues may be surprised at this, but in my opinion anaesthetists are generally pretty good people to have around for critically ill patients and as an EP there is always something to learn from a specialist airway doc. Let’s face it, no matter how many airways you do in the ED, in the UK at least, the anaesthetists will be doing more, albeit in a different setting and with a different patient population. Potential flaws and compounding factors. It is the nature of long term studies to be subject to a whole range of biases. Equipment, training, indications, drugs and experience change and that can have a significant effect on the findings if lumped together. To give the authors credit they have done some subgroup work on more recent intubations which suggest that EPs are better at intubation than previously. This is hopeful to those of us who regularly RSI in the ED! It perhaps also reflects the compulsory anaesthetic training in the current ACCS curriculum. ED trainees will now all have spent time in theatre, something that did not exist in my day. Many patients were excluded owing to missing data, representing 6% of the total and in retrospect the database could collect more and better data, I hope that they are making amends to this following the publication of this paper. I also hope that we might get a national database to learn from. Imagine what we could do with more departments contributing data. What does this paper mean for UK Emergency Physicians? The matter of ‘who’ performs RSI in the ED is a hotly contested topic and the arguments have been heard ad nauseum for years. I have no doubt they will resurface in the comments, probably by someone who has not read the paper (sigh in anticipation). I have no desire to start some stupid conversation about who is best at doing RSI. It’s boring. Stop it. Anyone writing a sentence containing the words ‘…… we own the airway……..’ , well don’t expect a positive response from us. You don’t own the airway and you never will. The airway belongs to the patient and at best you are merely a temporary custodian. What this paper does tell me is that a collaborative approach between anaesthetists, emergency physicians departments works. That’s it. Grown ups doing what’s best for their patients, working together and getting the job done. That is the message I am taking from this interesting piece of work. Rapid sequence induction in the emergency department: a strategy for failure. S Carley, C Gwinnutt, J Butler, I Sammy, and P Driscoll. Emerg Med J. 2002 Mar; 19(2): 109–113. Rapid sequence intubation in Scottish urban emergency departments. Graham CA1, Beard D, Oglesby AJ, Thakore SB, Beale JP, Brittliff J, Johnston MA, McKeown DW, Parke TR. Emerg Med J. 2003 Jan;20(1):3-5. Tracheal intubation in the emergency department: the Scottish district hospital perspective. Stevenson AG1, Graham CA, Hall R, Korsah P, McGuffie AC.Emerg Med J. 2007 Jun;24(6):394-7. The who, where, and what of rapid sequence intubation: prospective observational study of emergency RSI outside the operating theatre. Reid C1, Chan L, Tweeddale M. Emerg Med J. 2004 May;21(3):296-301. An observational survey of emergency department rapid sequence intubation. Butler JM1, Clancy M, Robinson N, Driscoll P. Emerg Med J. 2001 Sep;18(5):343-8.
thanks Simon for the thoughtful writing and insight into UK ED airway management. I am often dismayed by the tribal nature of the emergency airway in some sectors. I hope we can all do whats best for the patient and put egos aside. 1)	Training. UK ED trainees spend 6 months in anaesthetics in their second year of training, after which, they may never work in an ED in which EM doctors ‘Do’ airway. By the time that trainees reach consultant level, they are likely to have lost skills and lack confidence. Old school consultants may have done minimal or no airway training. IF they have no training, how can they be expected to instruct juniors in the ED? 2)	Tradition: For many years Anaesthetics have owned the airway in UK EDs (love it or hate it). Whilst many anaesthetists acknowledge the role of EM in airway management, there are still many unenlightened individuals who see the airway as an anesthetics only thing. Similarly there are many old school ED consultants with a strong surgical background who have no interest or affinity for airway management in the ED. Since there are often many more anaesthetics consultants, with a well-established royal college, it is easy to see how the status quo might be maintained. 3)	Workload: Why would EM consultants in a small department want to take responsibility for ED airway when they already have little time to teach, have an overflowing department, and not enough trainees or consultants to form an EM airway rota? It is easier to get another specialty involved, freeing up EM doctors to see more patients. 1)	Registrars should be mandated to do a certain number of RSIs a year in the ED. This should be enforced. Senior trainees should have to rotate to an airway friendly ED if required. If airway is prioritized in training, this would focus how an ED uses its trainees. 2)	Senior doctors should undergo training/CPD in airway. I think of this as akin to the open to laparoscopic transition that occurred in surgery. Doctors who had been doing open procedures for years were trained in a totally new technique through peer to peer support etc. 3)	The RCEM should write a document which outlines how an ED can take responsibility for airway. It should outline core standards, training, minimum staff requirements and and give practical examples. This should be a RCEM priority. Great piece. Thanks! How many visits do you have per year in Virchester? About 160,000 adults, 50,000 kids. Three departments. Large university hosp/trauma centre. Teritary kids ED. Thanks a lot Simon for this interesting article which makes me more enthusiastic in improving my airway managements skills. This discussion and article got another look from me with the most recent articles/blog coming out about RSI in UK. I was a reg in RIE through a fair chunk of 1999-2000, the start year of this study, with a group of the best registrars ever assembled (bias declared!). I also worked in another UK department where RSI and intubation and sedation belonged to the anaesthetic department and the culture was very different. So- if you can read past the statement “own the airway” (and in fact the general awfulness of this tweet) I wanted to give the readers in the UK a more balanced view of what actually happens in Oz than might emerge just from reading social media. If I was a patient, the ideal person managing my airway would not actually be a person, but a team, and that team would be able to provide a timely and appropriate mix of decision making, situation awareness, communication, drug choices and procedural expertise to rapidly and safely secure and check an ETT or alternative in a way that suited my whole body rather then just my airway and with the actual passage of the plastic tube down through my cords being just one part of the care. Even better, the hospital would be able to continue to function in a way that provided quality care to other patients across ED/Anaesthetics/ICU and elsewhere at the same time. I would not want turf battles to even enter into the thinking of the team or teams involved. So often, in Australia, or at least in all the hospitals I have worked in, there exists a sensible blend of “shared care” of airway. There is no point using a catchy testosterone rich phrase like “Own the Airway” in exclusion of an awareness of your own limitations and the additional skills and equipment available to our anaesthetic friends. “Own the airway” except in epiglottitis. Or When you are tired. Or when the department is overwhelmed. 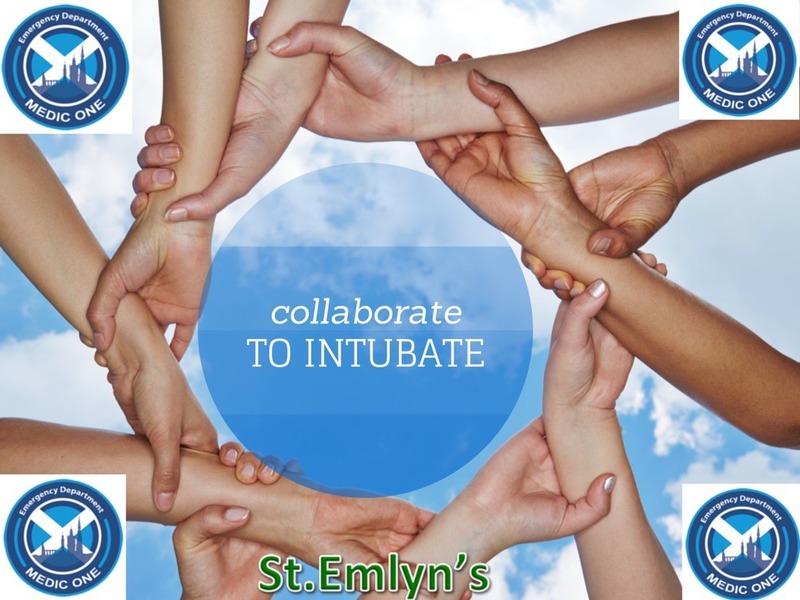 Or when…OK share the airway. In Australian ED’s we often use anaesthetics to back us up, but often do it all ourselves without them involved. When they are involved, depending on the situation and particularly the seniority of the ED and anaesthetic response sometimes we intubate, they assist, sometimes they intubate, we assist. It is harder to supervise intubation than it is to do it and harder to take on a failed intubation. We make those decision based on such an overwhelming mix of factors that I won’t even go into them. It necessitates joint training and simulation between us in decision making and expertise, and an understanding of each others strengths and limitations and “frames”. It also benefits from a shared language and communication and models such as the Vortex which belongs somewhere between the two teams. This sounds very similar to the model at your hospital. The similarities are far greater than the differences. Anything that you read that stresses strongly that Australian ED’s exclude anaesthetics should be read with a high degree of scepticism. Probably the real meaning of my tweet is not that we should not, as EM practitioners, own the airway, but we should make sure we are not excluded from it because a great system requires flexibility in the delivery of timely care. Seeing what was achieved in RIE during those early years makes me curious about why the politics or systems of UK hospitals allows the exclusion of ED from RSI in some departments. Given appropriate training, it shouldn’t. That pretty much sums the situation in Virchester. We do a lot of airway management ourselves but we would never be stupid enough or arrogant enough to suggest that we can do it without our anaesthetic friends and colleagues. In the same way that we work with every other speciality to deliver a team approach to care. I struggle with anyone who says always or never to any question like this. The Edinburgh approach similarly seems sensible and mature.